X Ray Mod for Minecraft 1.4.4 is a custom mod for Minecraft which changes your Minecraft into X Ray vision. 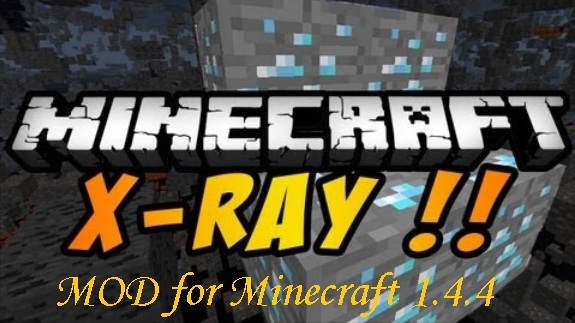 The previous version of Minecraft X Ray Mod was released with the reaction of the official Minecraft update and now the Minecraft X ray mod will again released due the official Minecraft 1.4.4 version. So guys have fun checking it out below..
– Make a backup copy of your Minecraft.jar, so you don’t lose anything. – Download the mod from the links above, open the zip file using WinRar/7zip. – Now go to Start > Run > Type %appdata% and hit enter. – Go .minecraft/bin sub-folder and open Minecraft.jar file using WinRar. – Drag and drop the mod files into .jar file. – Delete META-INF folder there, close everything. So guys don’t miss to comeback here and check the latest updates of your favorite game online here..